Introduction: With the exclusion of non-melanomatous skin malignancy, prostate cancer (PCa) is the second most prevalent cancer in men globally. It has been reported that the majority of men will develop benign prostatic hyperplasia (BPH) by the time they reach their 60s. Together, these prostatic diseases have a significant morbidity and mortality affecting over a billion men throughout the world. The risk of developing prostate cancer of men suffering BPH is one that has resulted in a healthy debate amongst the urological community. Here, we try to address this conundrum with clinical and basic science evidence. Materials and Methods: Data from an online search and contemporary data presented at international urological congresses was reviewed. Results: BPH and PCa can be linked together at a molecular and cellular level on genetic, hormonal, and inflammatory platforms suggesting that these prostatic diseases have common pathophysiological driving factors. Epidemiological studies are weighted towards the presence of BPH having a greater risk for a man to develop PCa in his lifetime; however, a conclusion of causality cannot be confidently stated. Conclusion: The future workload healthcare practitioners will face regarding BPH, and PCa will substantially increase. Further basic science and large epidemiological studies using a global cohort of men are required prior to the urological community confidently counseling their patients with BPH with regards to their PCa risk. The lifetime risk of a man developing histologically confirmed benign prostate hyperplasia (BPH) has been reported to be 50% in those in the 51-60 years age group and increasing to 70% in the 61-70 years age group. With the exclusion of non-melanomatous skin malignancy, prostate cancer (PCa) is the second most prevalent cancer in men globally. The International Agency for Research on Cancer reported that PCa accounted for 14% of cancers diagnosed in men and over 900, 000 cases were diagnosed throughout the world in 2008 alone. The exact etiology of both these prostatic diseases has yet to be fully elucidated. Anatomically, BPH arises from the transition zone of the prostate gland. PCa is an adenocarcinoma, which classically arises from epithelial cells located in the peripheral zone of the prostate gland alongside a small percentage arising from those cells that are located in the transition zone. In only 20% of cases do BPH and PCa co-exist in the same prostatic zone. In combination, both these diseases have a major influence on the morbidity and mortality in millions of men throughout the world. Advances in healthcare quality and provisions globally and the resultant increase in worldwide life-expectancy will ultimately lead to a significant percentage of men that will face either BPH or PCa individually or in combination. Furthermore, with the advent of more screening and disease detection strategies that have been adopted in national healthcare commitments throughout the world, the incidence and pick-up rates of these diseases will naturally increase in the younger population of men. Despite both these diseases being well established histologically, a definitive link between them has proven to be one that leads to a healthy debate and controversy within the urological community. Both diseases have striking similarities with regards to androgen-dependence driving their pathophysiology, inflammatory components which contribute to the development of the diseases, and shared genetic and epigenetic alterations. However, a causal relationship between these diseases has not been established. In this review, we address the question 'Is the presence of BPH a risk factor for the development of prostate cancer?' by using evidence ranging from basic science, genetic and major epidemiological studies conducted on this topic. The PubMed ® was searched for relevant articles and, in addition, we examined secondary sources from the reference section of utilized articles as well as data presented at recent urological congresses. The biggest epidemiological study to date to assess the risk of a man developing PCa following the diagnosis of BPH was reported by Orsted et al.,  in 2011. Using population-based databases, they evaluated this conundrum in the entire Danish male population over a 27-year period (n = 3,009,258) between 1980 and 2007. The multivariate, adjusted hazard ratios (HR) for PCa incidence/mortality was 2.22/2 (95% confidence interval, 2.13-2.31/1.91-2.08) amongst all men hospitalized for BPH compared to the general population control, respectively. This figure increased to 3.26/7.85 (95% CI; 3.03-3.5/7.40-8.32) when men who were surgically treated for BPH were taken into consideration versus the control group. Despite the authors'concluding that BPH was associated with a two-three-fold increased risk of the development of PCa alongwith a two to eight-fold increased risk of mortality, they stressed that this data should not be interpreted to infer causality. Limitations of this study included that the diagnosis of BPH was not a histological one but clinical, the relatively homogenous nature of this population group, and the issue that the study included use of patients in the pre-PSA era. The association of BPH and PCa has also been demonstrated in men with an ethnic low-risk of PCa. Asian men who were diagnosed with prostate cancer over a 10-year period and all of whom were over the age of 50 years had a strong association with prostatitis and/or BPH. There was a higher odds ratio (OR) for prostate cancer associated with BPH (26.2, 95% confidence interval (CI) 20.8-33.0) than with prostatitis (10.5, 95% CI = 3.36-32.7). With this in mind, recent studies have further re-iterated the link between BPH and prostate cancer with genetic evidence. With the utilization of technology, such as next-generation sequencing, it has provided us the ability to uncover disease-related variants by processing large genomic intervals in a rapid and thorough manner. Mutations in the HBOX13 gene have been established to be associated with the development of prostate cancer. Saaristo et al. assessed 100 single-nucleotide polymorphisms (SNP) in over 500 men with BPH who either remained with this disease or later developed prostate cancer. As expected, a mutation in HBOX13 was strongly associated with the prostate cancer specimens. However, BPH patients carrying this mutation had a 4.6 times greater risk of developing prostate cancer compared to non-carriers (OR 4.56, CI 95% 1.29-16.11, P = 0.0098). Interestingly, the average PSA levels at baseline biopsy in both groups were very similar (BPH = 7.3 μg/l (range 0.5-44 μg/l) and 8.0 μg/l (range 2.1-75 μg/l) respectively). This is the first study to report genetic predisposition to developing PCa in BPH patients and gives a future potential of predicting those men with BPH who will later go on develop PCa. Similarly, variants of numerous other genes have been shown to confer an increased risk of the development of both BPH and prostate cancer. 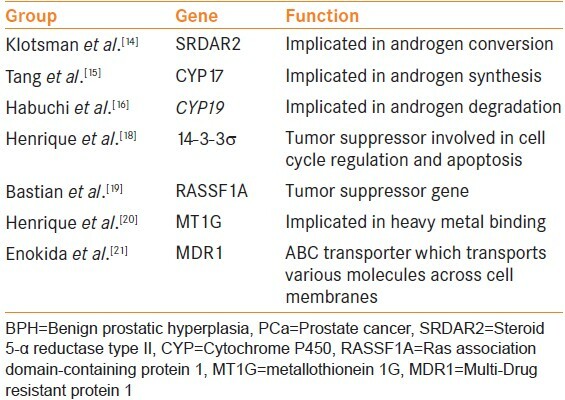 Variants of genes implicated in androgen conversion within the prostate (SRDAR2), those involving androgen synthesis (CYP17) and degradation (CYP19) have all commonly been shown to increase the risk of the development of BPH and prostate cancer. ,, DNA methylation is an epigenetic method, in which genes can be regulated via silencing of that particular portion of the genome. In PCa, there are numerous genes that have been shown to be hypermethylated and hence inactivated, ultimately leading to the progression of prostate cancer. 14-3-3σ is a putative tumor suppressor gene involved in cell cycle regulation and apoptosis following DNA damage. Its loss of expression has been established in numerous cancers including PCa. With the use of 189 patient specimens, Henrique et al. have shown that via epigenetic mechanisms, 14-3-3σ is significantly hypermethylated in both PCa and BPH samples. Similarly, epigenetic phenomenon have been shown to be shared between BPH and PCa tissues including tumor suppressors genes (RASSF1A),  heavy metal binding genes (MT1G),  or genes which encode for proteins such as ABC transporters (MDR1). All of these genes have also been shown to be hypermethylated in BPH and PCa specimens, suggesting the existence of an epigenetic link between BPH and PCa. Inflammation has been detrimentally linked to the development and presence of both BPH and PCa. Large population-based trials such as the Medical Therapy of Prostate Symptoms (MTOP) and more recently the Reduction by Dutasteride of Prostate Cancer Events (REDUCE) studies have demonstrated the association between inflammation and development of BPH. ,[ The MTOP study demonstrated that approximately 40% of baseline histological specimens of BPH harbored chronic inflammatory infiltrates, and this group of men had an increased baseline prostatic size (41 mls vs. 37 ml), higher baseline PSA levels (3.1 ng/ml vs. 2.3 ml), greater chance of disease progression (21% vs. 13.2%), increase in IPSS score (13.7% vs. 11.2%), and a significant increase in the incidence of the development of acute urinary retention (5.6% vs. 0%) in comparison to those men who harbored no stigmata of chronic inflammation on baseline histological specimens. The REDUCE trial showed that chronic inflammatory infiltration was more prevalent in men with BPH in comparison to benign controls and furthermore, the degree of LUTS attributed to BPH was correlated with the severity of inflammation present. With the use of immune-histochemical analysis in 282 specimens collected from a more focused group of BPH sufferers, all of whom underwent surgical treatment of the disease, demonstrated that 82% and 81% of specimens had T-lymphocyte markers and macrophage markers, respectively. Within this cohort, a correlation existed between those with high-grade inflammation and a higher IPSS score (21 vs. 12; P = 0.02) and prostatic volume (77 cm (3) vs. 62 cm (3); P = 0.002). Despite compelling evidence that both BPH and PCa share common inflammatory component driving disease progression, there is very limited evidence that the use of non-steroidal anti-inflammatory (NSAIDS) agents has a favorable outcome in decreasing incidence of BPH. A recently reported study investigated the use of NSAIDs in the form of aspirin and ibuprofen in nearly 5000 men. It concluded that the use of these agents had no protective effect on the development of BPH and LUTS. There is limited evidence that the use NSAIDs may provide a protective effect in the development of prostate cancer. A recent population study using over 9000 men has reported a modest reduction of 10% in the development of PCa with men using regular NSAID agents. The same group of authors also published a meta-analysis on this topic analyzing over 24,000 patients. The outcome of the meta-analysis was that the use of NSAID agents with the view of preventing prostate cancer was a suggestive one but certainly not one that is conclusive and would require further well-designed observational studies for greater insight and understanding into this topic. A common and well established driving factor co-linking the advancement and progression of both BPH and PCa is the action androgens have on prostatic tissue. Not only are androgens explicitly required for pathological growth of the prostate, they are vital for normal growth and development of this gland. The iso-enzymes 5-α reductase type 1 and 2 convert testosterone into its active form dihydrotestosterone (DHT), which in turn facilitates cellular differentiation and proliferation of prostatic tissue. Abnormal prostatic growth occurs when there is a disturbance on the androgen profile of the prostate, which encourages a proliferative state of the gland. This disrupted androgen cycle overcomes apoptosis within the prostate, therefore, disrupting the homeostatic regulation of prostate cell proliferation and cell death. The suppression of androgen activity on the prostate forms the basis of pharmacological treatment of both BPH and PCa. The hypothesis that higher circulating androgens may confer increased risk of prostate cancer has been assessed by large trials investigating the action anti-androgen agents have on the development of PCa. The Prostate Cancer Prevention Trial concluded that prescribing men finasteride for 7 years resulted in reducing the risk of the development of PCa by 25%. Similarly, the REDUCE trials, which prescribed men dutasteride over a 4-year period, resulted in a decrease in the incidence of PCa by 23%. As expected, both studies reported a favorable outcome on lower urinary tract symptoms related to BPH. Genetic, hormonal, and inflammatory mechanisms have all been shown to be common pathophysiological driving mechanisms for the development of both BPH and PCa, thus linking these diseases together. However, on a cellular and molecular level, no study has shown that the development of BPH tissue has later converted into an oncological disease. Furthermore, the exact pathways of these prostatic diseases have yet to be fully understood. This is essential for us to optimize future treatment strategies for both diseases and an issue that future basic science studies should target. Epidemiological data suggests that the presence of BPH increases the risk for a man to develop PCa in his lifetime. However, a causal link cannot be established from the current data. To determine the risk of the development of PCa of men presenting with BPH, we require further detailed epidemiological studies, which would ideally include a large cohort of men from a global platform. 1. McVary KT. BPH: Epidemiology and comorbidities. Am J Manag Care 2006;12 5 Suppl:S122-8. 2. McNeal JE. Normal histology of the prostate. Am J SurgPathol 1988;12:619-33. 3. Bostwick DG, Cooner WH, Denis L, Jones GW, Scardino PT, Murphy GP. The association of benign prostatic hyperplasia and cancer of the prostate. Cancer 1992;70 1 Suppl:291-301. 4. Chokkalingam AP, Nyren O, Johansson JE, Gridley G, McLaughlin JK, Adami HO, et al. Prostate carcinoma risk subsequent to diagnosis of benign prostatic hyperplasia: A population-based cohort study in Sweden. Cancer 2003;98:1727-34. 5. Alcaraz A, Hammerer P, Tubaro A, Schroder FH, Castro R. Is there evidence of a relationship between benign prostatic hyperplasia and prostate cancer? Findings of a literature review. EurUrol 2009;55:864-73. 6. Orsted DD, Bojesen SE, Nielsen SF, Nordestgaard BG. Association of clinical benign prostate hyperplasia with prostate cancer incidence and mortality revisited: A nationwide cohort study of 3,009,258 men. EurUrol 2011;60:691-8. 7. Hung SC, Lai SW, Tsai PY, Chen PC, Wu HC, Lin WH, et al. Synergistic interaction of benign prostatic hyperplasia and prostatitis on prostate cancer risk. Br J Cancer 2013;108:1778-83. 8. Schenk JM, Kristal AR, Arnold KB, Tangen CM, Neuhouser ML, Lin DW, et al. Association of symptomatic benign prostatic hyperplasia and prostate cancer: Results from the prostate cancer prevention trial. Am J Epidemiol 2011;173:1419-28. 9. Miah S, Catto JW. MicroRNA in prostate cancer: An opportunity to individualize patient care. J Urol 2012;187:1155-6. 10. Catto JW. The changing face of prostate cancer: Can gains in epigenetic knowledge translate into improvements in clinical care? J Mol Med (Berl) 2006;84:883-5. 11. Prakash K, Pirozzi G, Elashoff M, Munger W, Waga I, Dhir R, et al. Symptomatic and asymptomatic benign prostatic hyperplasia: molecular differentiation by using microarrays. Proc Natl Acad Sci U S A. 2002 May 28;99(11):7598-603. 12. Saaristo L, Wahlfors T, Schleutker J, Lija H, Tammela T, Matikainen M. Genetic testing in identification of BPH patients developing later prostate cancer. Eur Urol suppl. 2013;12(1):e1039. 13. Orsted DD, Bojesen SE. The link between benign prostatic hyperplasia and prostate cancer. Nat Rev Urol. 2013 Jan;10(1):49-54. 14. Klotsman M, Weinberg CR, Davis K, Binnie CG, Hartmann KE. A case-based evaluation of SRD5A1, SRD5A2, AR, and ADRA1A as candidate genes for severity of BPH. Pharmacogenomics J. 2004;4(4):251-9. 15. Tang L, Yao S, Till C, Goodman PJ, Tangen CM, Wu Y, et al. Repeat polymorphisms in estrogen metabolism genes and prostate cancer risk: results from the Prostate Cancer Prevention Trial. Carcinogenesis. 2011 Oct;32(10):1500-6. 16. Habuchi T, Liqing Z, Suzuki T, Sasaki R, Tsuchiya N, Tachiki H, et al. Increased risk of prostate cancer and benign prostatic hyperplasia associated with a CYP17 gene polymorphism with a gene dosage effect. Cancer Res. 2000 Oct 15;60(20):5710-3. 17. Cheng L, Pan CX, Zhang JT, Zhang S, Kinch MS, Li L, et al. Loss of 14-3-3sigma in prostate cancer and its precursors. Clin Cancer Res. 2004 May 1;10(9):3064-8. 18. Henrique R, Jeronimo C, Hoque MO, Carvalho AL, Oliveira J, Teixeira MR, et al. Frequent 14-3-3 sigma promoter methylation in benign and malignant prostate lesions. DNA Cell Biol. 2005 Apr;24(4):264-9. 19. Bastian PJ, Ellinger J, Wellmann A, Wernert N, Heukamp LC, Muller SC, et al. Diagnostic and prognostic information in prostate cancer with the help of a small set of hypermethylated gene loci. Clin Cancer Res. 2005 Jun 1;11(11):4097-106. 20. Henrique R, Jeronimo C, Hoque MO, Nomoto S, Carvalho AL, Costa V, et al. MT1G hypermethylation is associated with higher tumor stage in prostate cancer. Cancer Epidemiol Biomarkers Prev. 2005 May;14(5):1274-8. 21. Enokida H, Shiina H, Igawa M, Ogishima T, Kawakami T, Bassett WW, et al. CpG hypermethylation of MDR1 gene contributes to the pathogenesis and progression of human prostate cancer. Cancer Res. 2004 Sep 1;64(17):5956-62. 22. Nickel JC, Roehrborn CG, O›Leary MP, Bostwick DG, Somerville MC, Rittmaster RS. The relationship between prostate inflammation and lower urinary tract symptoms: Examination of baseline data from the REDUCE trial. EurUrol 2008;54:1379-84. 23. Robert G, Descazeaud A, Nicolaiew N, Terry S, Sirab N, Vacherot F, et al. Inflammation in benign prostatic hyperplasia: A 282 patients› immunohistochemical analysis. Prostate 2009;69:1774-80. 24. MacLennan GT, Eisenberg R, Fleshman RL, Taylor JM, Fu P, Resnick MI, et al. The influence of chronic inflammation in prostatic carcinogenesis: A 5-year followup study. J Urol 2006;176:1012-6. 25. Nelson CP, Kidd LC, Sauvageot J, Isaacs WB, De Marzo AM, Groopman JD, et al. Protection against 2-hydroxyamino-1-methyl-6-phenylimidazo[4, 5-b] pyridine cytotoxicity and DNA adduct formation in human prostate by glutathione S-transferase P1. Cancer Res 2001;61:103-9. 26. De Nunzio C, Kramer G, Marberger M, Montironi R, Nelson W, Schroder F, et al. The controversial relationship between benign prostatic hyperplasia and prostate cancer: The role of inflammation. EurUrol 2011;60:106-17. 27. Beuten J, Gelfond JA, Franke JL, Shook S, Johnson-Pais TL, Thompson IM, et al. Single and multivariate associations of MSR1, ELAC2, and RNASEL with prostate cancer in an ethnic diverse cohort of men. Cancer Epidemiol Biomarkers Prev 2010;19:588-99. 28. Sutcliffe S, Grubb Iii RL, Platz EA, Ragard LR, Riley TL, Kazin SS, et al. Non-steroidal anti-inflammatory drug use and the risk of benign prostatic hyperplasia-related outcomes and nocturia in the Prostate, Lung, Colorectal, and Ovarian Cancer Screening Trial. BJU Int 2012;110:1050-9. 29. Mahmud SM, Franco EL, Turner D, Platt RW, Beck P, Skarsgard D, et al. Use of non-steroidal anti-inflammatory drugs and prostate cancer risk: A population-based nested case-control study. PLoS One 2011;6:e16412. 30. Mahmud SM, Franco EL, Aprikian AG. Use of nonsteroidal anti-inflammatory drugs and prostate cancer risk: A meta-analysis. Int J Cancer 2010;127:1680-91. 31. Carson C 3 rd , Rittmaster R. The role of dihydrotestosterone in benign prostatic hyperplasia. Urology 2003;61 4 Suppl 1:2-7. 32. Andriole GL, Bostwick DG, Brawley OW, Gomella LG, Marberger M, Montorsi F, et al. Effect of dutasteride on the risk of prostate cancer. N Engl J Med 2010;362:1192-202. 33. Thompson IM, Goodman PJ, Tangen CM, Lucia MS, Miller GJ, Ford LG, et al. The influence of finasteride on the development of prostate cancer. N Engl J Med 2003;349:215-24.